You’ll want to set aside some time for the tofu prep, but not to worry—it’s almost entirely hands off. The rest of the recipe comes together quickly. With a little planning and a touch of multi-tasking, you’ll be digging in to some down-home goodness in no time. 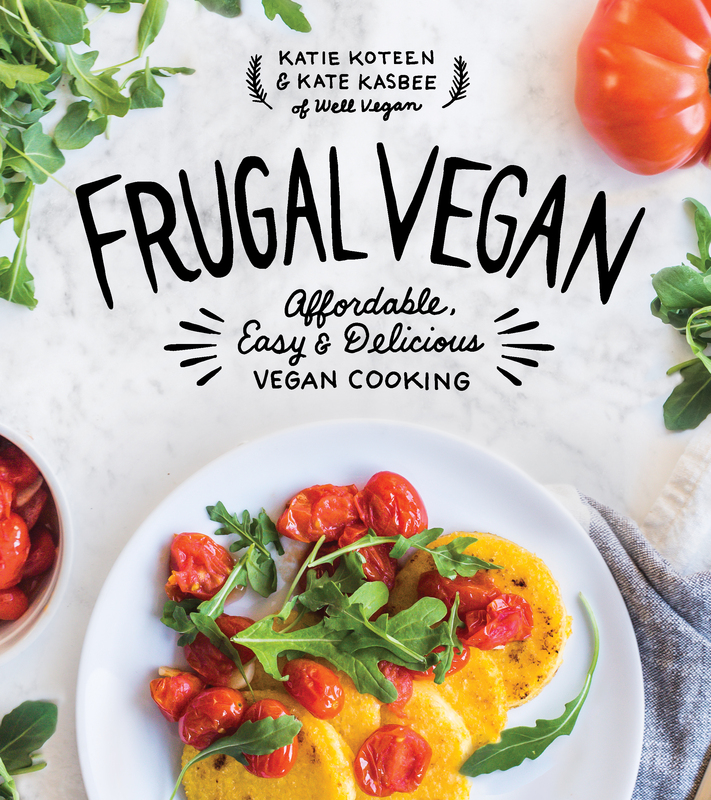 This recipe comes from Frugal Vegan: Affordable, Easy & Delicious Vegan Cooking . Place the potatoes in a large pot, cover with water and bring to a boil. Cook, uncovered, for 10 to 15 minutes or until the potatoes are tender. Drain and return to the pot. Add the vegan butter and nondairy milk. Mash with a potato masher and season with salt and pepper. After your tofu is drained and pressed, cut the block in half and immerse it in the vegetable broth. We use a container, such as Tupperware, that’s just slightly larger than our tofu block. Let that sit for an hour or two in the fridge. Remove the tofu from the vegetable broth and drain to remove any excess liquid. Cut the tofu into about 16 equal strips. In a small bowl, mix the mayo and hot sauce. You’ll also want to have the cornstarch and panko in separate bowls for your dipping assembly line. Dip the tofu strips in cornstarch, buffalo mayo and finally panko bread crumbs, in that order. Heat half of the oil in a medium nonstick or cast-iron pan. Add the tofu strips, turning to brown on all sides, 3 to 4 minutes per side. Set on a paper towel–lined plate to drain off any excess oil. You may need to do a few batches and add additional oil to work through all of your strips. Warm your frozen corn on the stovetop or in the microwave and make the gravy. 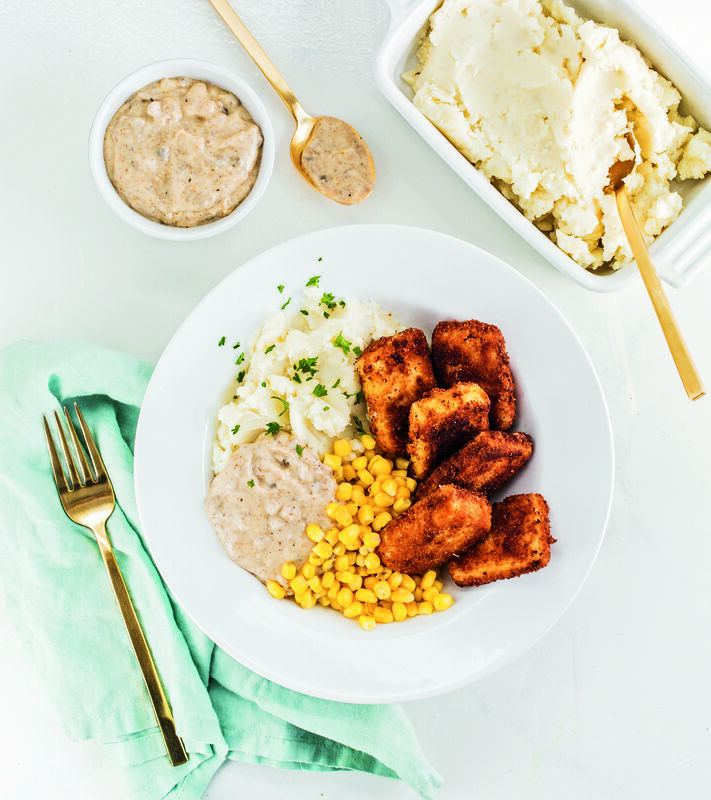 Finally, assemble your bowl: mashed potatoes, crispy buffalo tofu, corn and gravy.